San Diego Mayor Kevin Faulconer was tapped Wednesday to be one of five California mayors to join a White House initiative to end homelessness among former members of the armed forces. The Mayors Challenge to End Veteran Homelessness was announced by first lady Michelle Obama and Shaun Donovan, secretary of Housing and Urban Development. 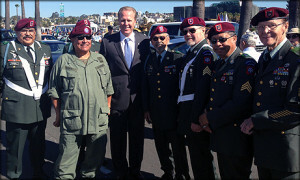 San Diego Mayor Kevin Faulconer with military veterans via San Diego Mayor’s office. The program involves leaders with HUD, the U.S. Department of Veterans Affairs, U.S. Interagency Council on Homelessness and National League of Cities. The purpose of the mayors challenge is to work at ending homelessness nationally by implementing strategies locally, according to the White House. A count in January found more than 8,500 homeless people in San Diego County, around 17 percent of whom were veterans. The figure for ex-military members was up 2 percent from one year earlier. Other California mayors participating in the White House initiative are Ashley Swearengin of Fresno, John Marchand of Livermore, Jean Quan of Oakland and John D’Amico of West Hollywood.